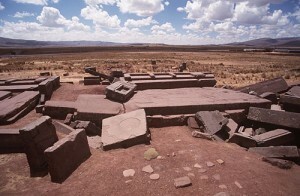 Puma Punku is a wondrous set of ruins located in the in the ancient city of Tiahuanaco of Bolivia. Filled with massive, precisely cut stones, these very ancient and mysterious ruins have baffled archaeologists and researchers for years. 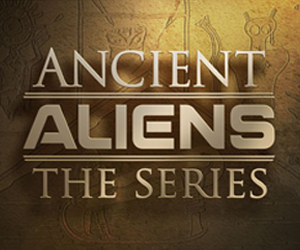 Ancient alien theorists believe that there may be only one explanation of such amazing workmanship, which dates back thousands of years: Aliens either created the ruins with advanced tools and machinery or they assisted humans in the task. The mysteries of these ruins are how they were carved and how they were brought to the top of a plateau. 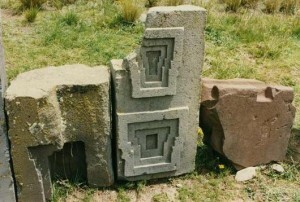 The blocks that created the ruins of Puma Punku were made from very hard rocks of granite and diorite, which are both nearly impossible to cut with anything besides diamond, yet there is no trace of diamonds near the site. In addition to the unknown tools that were used, people are also amazed by the the incisions that were made in the stones. The cuts are extremely fine and perfectly straight, with many pieces stacked or placed together with no spaces or mortar between them. The interlocking of the stones creates a precise puzzle of flawless pieces. Some of the straight grooves are only 1 cm deep, suggesting that a very advanced machine was responsible for creating such precision. Also, the holes that were formed into the stones are perfect, and all of equal depth, suggesting a high-tech drill of some kind was responsible. The work done on these stones is advanced and would require the most sophisticated of tools, leaving many wondering how it would have been possible for men living in that area thousands of years ago. This work could have been created from 500 B.C. to the ice age. Even today with modern technology, it would be nearly impossible to replicate these ruins. This is why ancient alien theorists hypothesize that only aliens could be responsible for helping such primitive people create this work of art. In addition to the extraordinary carvings and precise craftsmanship, the maneuvering of these stones is just as baffling. Many of the blocks weigh about 200 tons and some are as heavy as 450 tons and more. The question is, how in the world did these stones get on top of a 13,000 foot plateau and how were they moved into place to form the interlocked puzzles? While there are explanations of stones being rolled on tree trunks in other areas, this theory does not apply to Puma Punku because there are absolutely no trees on the plateau. There has not been an explanation of either the carving or maneuvering of these massive stones. According to experts, whoever built the ruins of Puma Punku must have known mathematics and astronomy and would have had to draw plans and write. However, there is no evidence that these ancient people were involved with any of this. There are no drawings or writings anywhere on or near the ruins, nor is there any evidence that people of that time were capabale of such knowledge. There are some who suggest that an advanced civilization of people lived in this area of Bolivia who had writings and plans for this amazing work, but a catastrophic event swept away the remains of the population and created the ruined look of the stones. There is some evidence to suggest that there was a great flood thousands of years ago that might have wiped out these ancient people and their records. However, this is just a theory. The conclusion is that there is no good explanation for how these ruins were created. 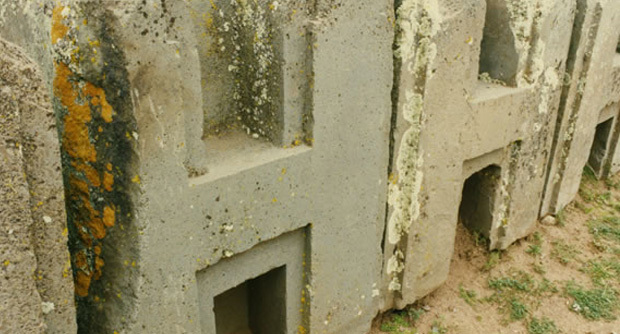 It continues to be a great mystery to this day that has many ancient alien supporters believing that Puma Punku is probably the most significant evidence that earth was visited by extraterrestrials in ancient times. After watching the Ancient Alien programs it has changed my beliefs. And have been somewhat paronoid thinking I maybe being observed or something. It would be awesome if there really were a really advanced society waiting to make peace and give us more knowledge. How to move stones. Look at how the natural actions of this universe and planet moves them. They do get moved. Parts of plates of the continents get turned over. Tilted. Washed. Vibrated. Wind moves some. Ice moves many. ect. Lakes get raised from sea level to very high places by Plate movements. Sometimes quicker than most generaly. . Any size stone can be moved, even up hill by freezing water.This action even lifts stones almost straight up and out of the ground. ie. pile dirt around a stone and put in water under the stone and freezing will lift it. Then repeat. ect. ..they did not match my idea of a pyramid at all……….. my many drawings all had steps and lush green surroundings…… such vivid sounds of hundreds of different animals……. vivid smells of plants,,,trees,,,flowers…etc…..
…..vivid colors of sky….earth….brilliant greens from surrounding forests……brilliant colors from all the animals……..and beautiful colors of the clothes the people were wearing including myself. The Egypt scene I was being shown in school around age 8 had none of that. I was confused and said nothing to anyone. One day a few years later one of the teachers recognized a painting I made in art class — and said OH – you know Machu Pichu”. I had no idea what she was talking about so she showed me a book. I recognized every single page in it. I could easily tell her what was around the corner of each building. I could easily remember the smells,,,,sounds,,,views etc. I told her there were two places I knew. What was the other one she asked….but I did not know what it was called. Only my pictures in my mind. She did know it….. She showed me a photo in another book and sure enough- it was — tao tewaukon. Later she found another location from my drawings ==== puma punku. That teacher moved away and I dropped my quest because nobody else took me seriously. I have detailed dreams about how much I loved my people of the land. My memory is of being a queen of a great King – I can see and still hear his voice but no name. I remember helping people with crops, education, judgments & tribunals, health issues and festivals. The information I see on TV sometimes is confusing to me. Nobody did any sacrifices or warring with neighbors. Every day was about education, peaceful kindness and happy living by thankfulness from our creator. The last memory I have is a traumatic awareness we all had to suddenly leave immediately — but I don’t know why. I can remember how my heart hurt because I could not imagine life anywhere else. I can remember watching the sky night and day with other people and talking extensively about it…but I don’t know why. The last 10 years I have lost many hours of sleep at night due to my dreams of this. My day visions sometimes make me pull off the side of the road — they are so strong. Now the last two years I have started hearing voices – whispers and seeing things – people here and there. Just barely there like I need better glasses or something …or a hearing aid to hear better. I am overwhelmed and take notes all the time but have to hide them. The strongest feeling every second of my life is to hurry – we don’t have much time ! *** get back to your home Tao tewukon…..get ready……..but I don’t know what for. I know the voices are quiet so I listen more intently. I know they are emphasizing timing and a schedule I must be aware of. I know I my heart aches for missing my king and my people I loved so very much. I know the years I live now …. in this life are measured much more shortly than in my previous life. But I don’t know who to ask for help. I attached photo of me to this email. Maybe you can see something.